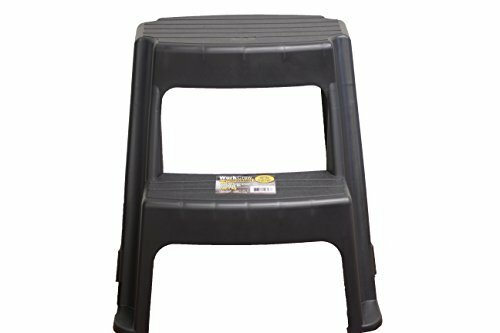 The Work Crew MK-40797 2-Step Molded Plastic Stool is a perfect tool when you need a little extra height for items in the kitchen, bathroom, office or garage. Designed with a solid molded plastic frame, non-slip step treads and a 300-pound weight capacity, you'll feel safe and comfortable getting to those hard to reach places. The stool features non-marring feet that wont haem your floor. The Work Crew MK-40797 measures 16 inches (L) by 18 inches (H) by 18 inches (W) and weighs approximately 5 pounds. The durable 2-step stool has a black finish and a 7-foot reach height. Work Crew products aim to simplify everyday life by consumer and commercial products. If you have any questions about this product by Work Crew, contact us by completing and submitting the form below. If you are looking for a specif part number, please include it with your message.